Professor Ewa Letowska Awarded the 2017 Courage in Public Scholarship Award! 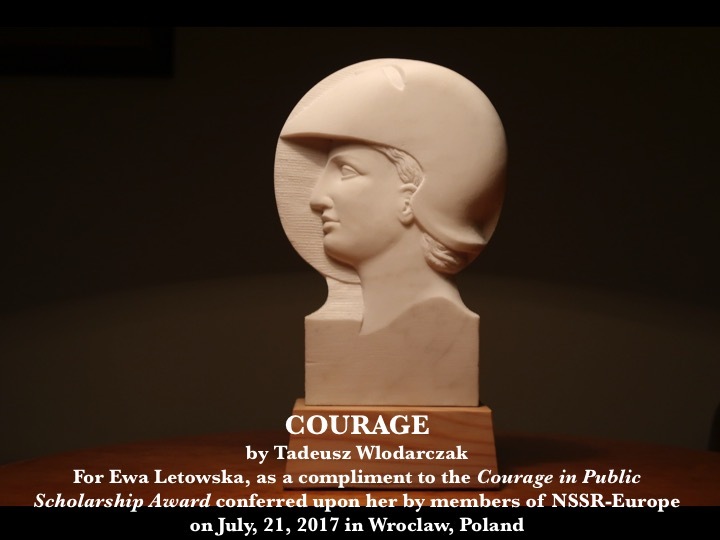 The Transregional Center for Democratic Studies (TCDS) at the New School for Social Research (NSSR) and the NSSR Europe Collective are happy to announce that that Professor Ewa Letwoska will be awarded the third annual Courage in Public Scholarship Award. The awardee is Poland’s extraordinary jurist, former Ombudsperson, and a former judge on Poland’s Constitutional Tribunal — Professor Ewa Letowska, an audacious intellectual and a remarkable human being who is highly respected in Europe and beyond. The award itself comes this year in the form of a sculpture created for the occasion by Wroclaw artist and long-time friend of the Institute, Tadeusz Wlodarczak. Below is the laudatio for Prof. Letowska written and read by Prof. Irena Gross of Princeton University. Previous winners of the award are the eminent philosopher and activist Agnes Heller, NSSR Professor Emeritus of Philosophy who now lives in Budapest, and Prof. Ann Snitow, prominent American academic based in New York, writer, and activist committed to gender justice and equality, whose work in Central and Eastern Europe over a quarter of a century has helped to recast social discourse, reshape the culture, and empower women in this part of the world. The NSSR Europe Collective was formed in 2014 by TCDS alumni who consider themselves an intellectually engaged microcosm of the NSSR within the new post-cold-war Europe. The Courage in Public Scholarship Award was created out of a shared sense of ethical and intellectual crisis facing academics in Europe and beyond, and awarded each year to an individual who has contributed significantly to social thought as well as exemplified a life dedicated to civic engagement. It is a great privilege and honor for me to pronounce this laudation for professor Ewa Letowska on the occasion of the award for Courage in Public Scholarship. In this very moment of the assault on the judiciary, it is hard to imagine a person more deserving of that award. 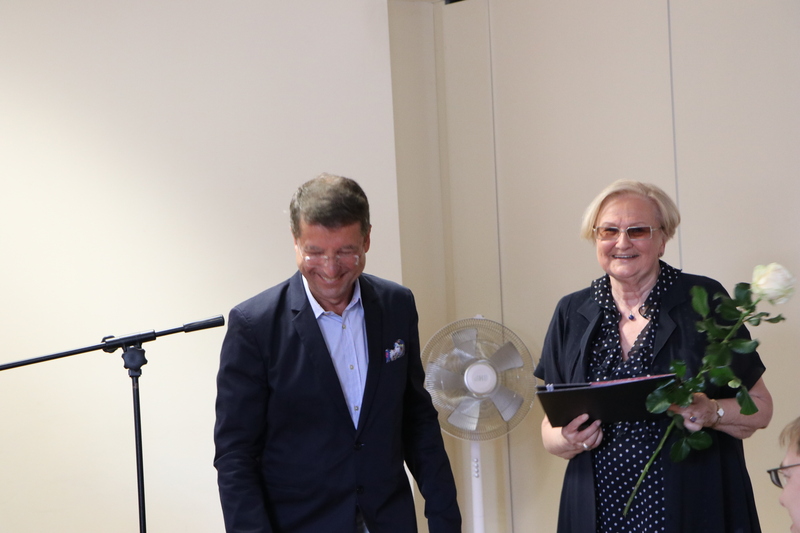 It is meant to recognize Professor Letowska’s extraordinary contributions to the development of civic life in Poland and in other countries of East Central Europe, and the courage and persistence in her fight to support democracy and justice. Her contribution consists not only of her legal work, but also of her writing career, educational projects, music journalism and, especially, of her serving through her actions as a model of civic engagement and moral courage. And we are very conscious that her courage, wisdom and perseverance are needed now as much if not more than before. Professor Letowska’s life and work are quite extraordinary, so allow me to run briefly through her cv. She is the author of several books on legal matters, as well as books on the history of opera, written together with her husband, professor Janusz Letowski, an eminent legal scholar and judge, who died in 1999. She collaborated with the Helsinki Committee, specializing in human rights but also in media. Her influence on the promotion of legal knowledge can be compared only to that of the late Wiktor Osiatynski. When she was the Ombudsman – the first ombudsman in a country of the Soviet bloc, she expressed many times her conviction that the law works only as long as society understands and implements it. Her writings, media contacts, lectures and teaching served to illuminate the possibilities of law and the value of its active implementation. Her writings reflect her wonderful engagement and vitality, and her commitment to democratic dialogue which requires attention, patience and focusing on the interlocutor. As an example of her work I would like to quote her 1994 book “Po co ludziom konstytucja” (Why do people need a constitution). It is a great book — very intelligent, informative , useful, and communicative though presenting difficult issues that at that time were really new. I think that the best name for what it was doing is: law with human face. It was a truly democratic approach to law. As we know, the system that ended in 1989 had a particular tendency to ruin any good idea by appropriating it and implementing in a distorted way. It is especially true about the legal system and constitution. So the task of an ombudsman, professor or judge – all functions performed by professor Letowska – was not only to learn but also to teach and convince the public that the law may be put to better uses than those from the previous regime. Professor Letowska studied American and Western constitutions, looked at the work of the American Supreme Court, debated various cases and proceedings. The resulting book was a wonderfully accessible yet intellectually and historically engaged book that was read by the general public and by students in high schools who were writing their own constitutions. The moment was truly constitutional, as the present constitution was then being discussed and negotiated. It was a great and lasting contribution of Professor Letowska to that very important process. I need to disclose that I was one of the people who helped in the birth of that book. I was working at that time at the American Council of Learned Societies, an institution that was very interested in the promotion of constitutionalism around the globe. I have in my papers a file entitled “Letowska” with exchanges of letters and plans of various kinds of collaboration between the organization I was working for, and, on behalf of that organization professors Stanley Katz and Douglas Greenberg with professor Letowska. The letters are from years 1993-1996, and the plans pertain to a few conferences but most of all to the writing of book “Why do people need a constitution.” The book was published in 1994 in Warsaw, and later also in Russia. Looking at the English-language synopsis of the book, prof. Katz wrote: ‘You have done your country and your foreign friends a great favor in undertaking this very large task, and I cannot thank you enough for having accomplished it in such a fine style. Meeting you has been one of the great pleasures of my eight years as President of ACLS. It is seldom that famous people are quite so charming and approachable as you are, and I very much look forward to seeing you under more relaxed circumstances someday soon in Warsaw. Needless to say, I also look forward to meeting your equally famous husband. “ (May 3, 1994) Professor Katz, who teaches now at Princeton University, asked me to congratulate you on your award. He stands by his compliments, so, allow me, through this quotation, to complement Professor Letowska on her charm. I also want to say that I reread her and her late husband’s book on the history of opera and I loved it again. This “again” is important: the work of Professor Letowska, though these times are hard, continues to be important and influential. In the domain of law and, in general, in the domain of culture. Civic, legal, musical and otherwise. Thank you and congratulations.